Hello everyone! Thank you for joining me on my 200th video! This ASMR video features: “Dark Feather,” brush sounds, scraping, soft speaking, uncapping, and “crinkle shirt” sounds (as made popular by MassageASMR). 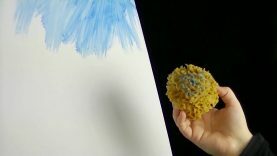 For many of us, Bob Ross videos are some of our earliest memories of being triggered. I wanted to pay homage to him (without being able to paint to save my life) and interact with you guys—so I was inspired by something jacksepticeye does called “Drawing Your Tweets.” If you tweeted me with #BobRossMyTweet and an idea, you might see yours in this video. This video was HARD (two cameras, one binaural mic, one stereo clip mic) to complete. I really needed an additional camera person and a ton more space, but I did the best I could with what I had. I REALLY hope it works for you, because I wanted this to be a celebration of you guys, ASMR, and our journey thus far making this channel together. Happy Viewing! Paypal account: I love making these videos, so regardless of donations, I will still be doing what I love—that said, any donations are greatly appreciated. Want more Dark Feather? She’s either in the spa or the library!